Spread orange sauce or orange jam along the sides of 2 individual glasses. 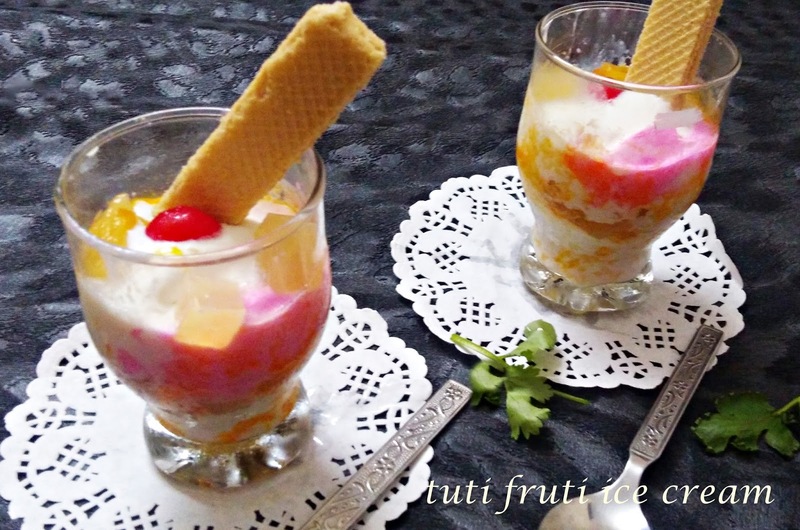 Put one scoop each of vanilla ice cream in both the glasses then put a layer of chopped canned fruits, then one scoop of strawberry ice cream again a layer of chopped canned fruits and then a scoop of vanilla ice cream and final layer of chopped canned fruits. Garnish it with a canned cherry and a wafer. 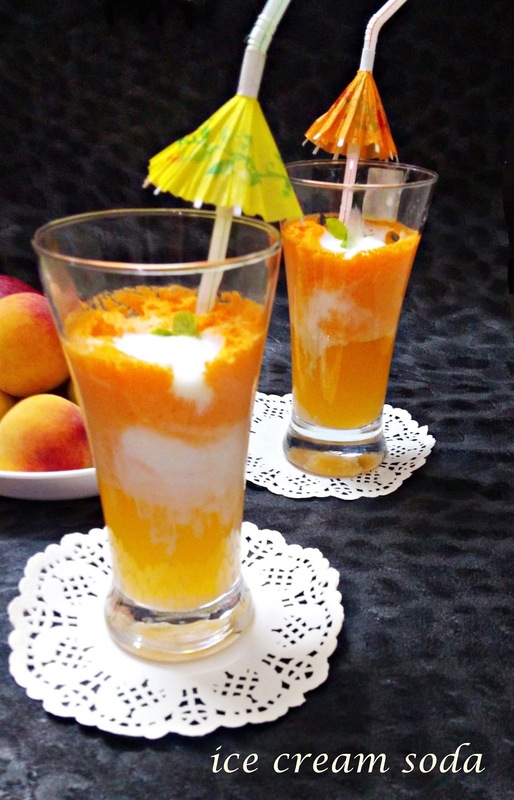 Place two scoops vanilla ice cream in a glass and top with chilled soda of your choice. I have used orange soda (MARINDA). Take All the ingredients in a bowl except for oil and dal and mix well. 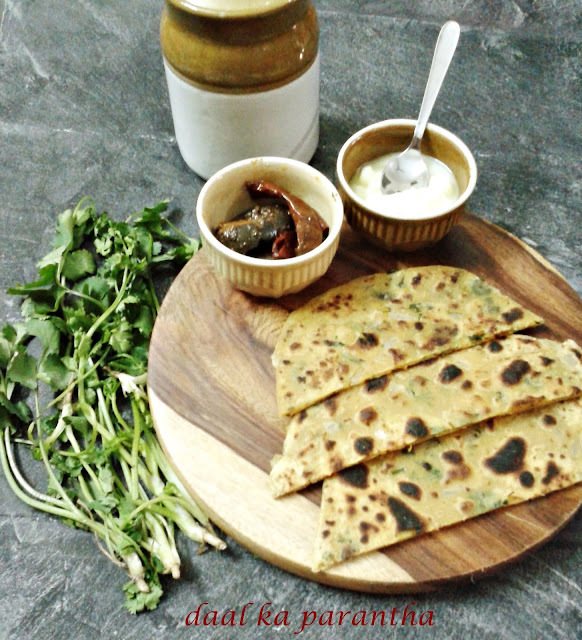 Now add dal little by little and knead a soft dough as you knead for chapati. Keep it under cover for 10-15 minutes. Heat tava and take a medium size ball dust it with some dry flour and roll it with the help of a rolling pin. Spread 1/2 tsp oil in the center and gather the edges in the center..
Place it on a hot griddle pan (tava)and turn the side after 1 minute. 1*. I used left over moong daal. 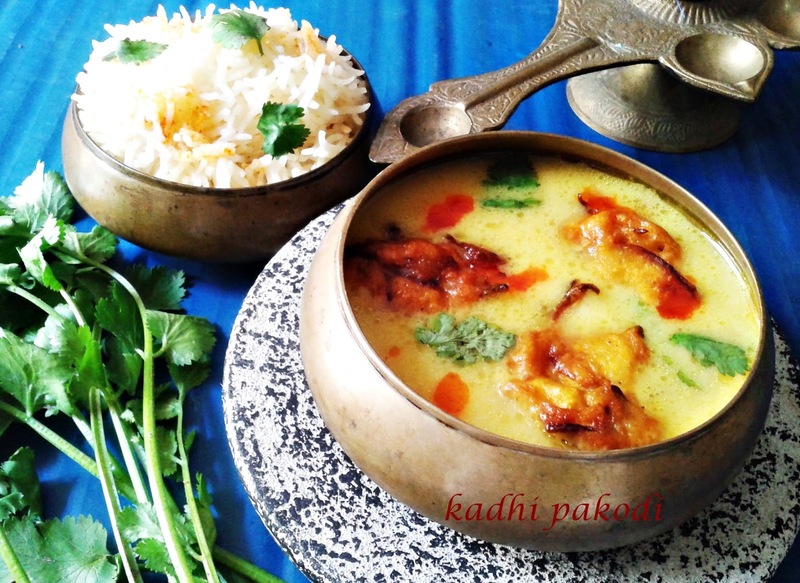 any left over daal can be used like channa dal, mah chole ki dal , sabut moong dal or daal makhni etc. Mean while heat oil in a pan and mix rest of the ingredients listed in pakodi list. Make a thick batter using the required water and make pakodis by dropping a tsp full of batter in hot oil. Fry till they become brown in color from both the sides . Take them out on an absorbent paper and keep aside. Add the fried pakodies and all the spices. chocolate shavings to sprinkle on the cake. Sift the flour,coco powder,baking soda and baking powder together in a bowl. Add the all purpose flour mix in to the above mixture and use cut and fold method to make a batter or thick consistency without any lumps. FInally, add vinegar and fold in gently. Ckeck with the help of a knife if it comes clean then it is done,now remove it from oven and let it get cool. Cut the cake into three slices using a sharp knife. Take the bottom layer and spread the cherry syrup all over then spread a layer of whipping cream. Now place some de-seeded cherries and cover this layer with another slice of cake. Repeat step 11 and 12 . 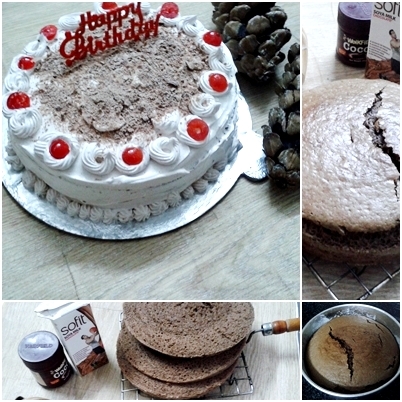 Now after placing the final layer cover the whole cake with whipped cream. 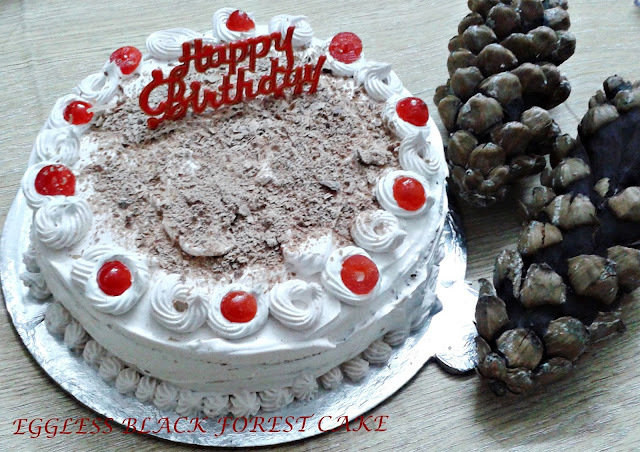 Decorate the cake with whipped cream using a pipping bag and a star nossel. Place some cherries on the top and cover the center with chocolate shavings. Place the softened butter in a bowl and add the icing sugar,milk and cocoa powder along with vanilla extract (if using). Mix thoroughly until you get a soft mixture like frosting. Take about 1 tsp of the chocolate frosting and spread over the Marie biscuit. Take the second biscuit and repeat the same process until you have a long biscuit stack with chocolate frosting in between. Smear the remaining chocolate frosting all over the biscuit tower generously. Refrigerate this biscuit tower for approximately 2 hours or overnight. Take it out and lay down on a cutting board. 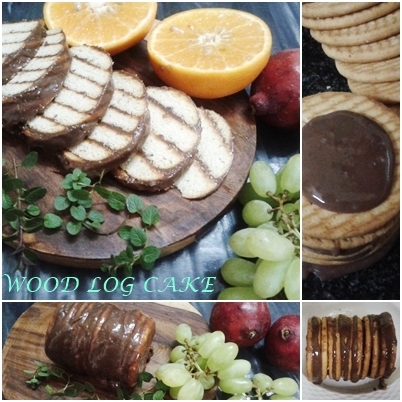 Use a fork to create lines over the chocolate log to resemble the lines on a wooden log. Cut slightly diagonally to get your log cookies, the biscuits would be soft by then.